We have a wonderful guest post today… Shaye at the Elliott Homestead. I love her recipes, and when she talks food, I get excited. Especially when It’s about “Whole Foods”. We hope to have her back again! I’ve said it before and I’ll say it again…eating whole, real, high quality foods is a journey. Chances are, you aren’t just going to wake up one morning with a counter full of soaking and fermenting products. No kefir fairy will come and make a pro-biotic rich product in your fridge. It just ain’t gunna happen. Lucky for us, we have resources. We have each other. We have the wisdom of past generations. And we have the internet. All of these great resources combine into a wonderful bounty of knowledge that can be used to further increase our productivity and knowledge of “real” foods and teach us to be less dependent on packages from the grocery store. Here on our homestead, we’ve come far on our food journey since beginning it a few years ago. While we used to purchase bread, chips, cereals, crackers, cookies, and prepackaged meats at the store…we now have traded all of these “kitchen staples” in for new and improved varieties! We now buy all of our organic grains in bulk to help reduce the cost. We soak and bake our own bread. We make sourdough crackers, in place of chips. We make cookies from ground almonds. We purchased locally raised meat and make all of our own stocks and lunch meats. We’ve ventured into brewing kombucha and ginger beer. We ferment and drink kefir on a daily basis, made from raw milk we purchase from a nearby dairy. All of these changes took time and consideration. They took planning and a change of routine – forcing us to break out of stale, old, unhealthy habits! And what a blessing that is! Not only have we never felt better, health wise, but we also love knowing that we are able to produce delicious, nutrient-dense, high quality food right here in our own kitchen. I’d like to share one of these recipes with you, which is originally from Nourishing Traditions (my go-to source for everything in my kitchen!). I’ve made it a few times…and lawdy, is it delicious. Simple. Sweet. Refreshing. Perfect for a summer evening. 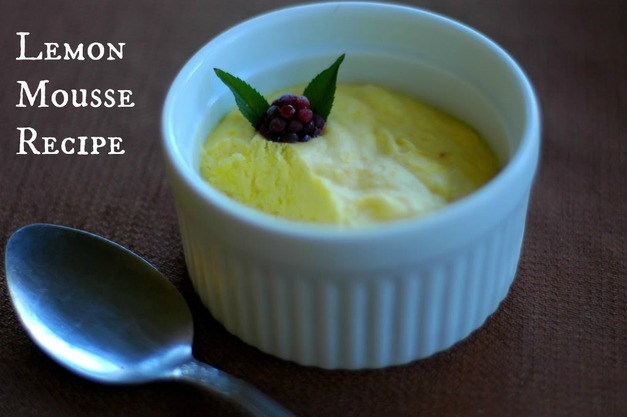 Lemon Mousse. I’m drooling right now, just typing that. Side-note: The quality of the ingredients used in the recipe matters. I wouldn’t trust just any ‘ol raw egg from the store here. Seek out a high quality, free range source for local eggs near you! Ask around! Put in the leg work to find a good egg supplier – trust me, once you start eating real eggs, you will never ever ever go back to eating the pale, tasteless ones from the store. Also, take the time to find a high quality cream. Raw cream is best, but if you can’t find it, at least find a high-quality pasteurized cream (NOT ultra-pasteurized)! In my state (Washington), it’s illegal to sell raw cream, so the best I can find is pasteurized cream from a nearby dairy. Yum! 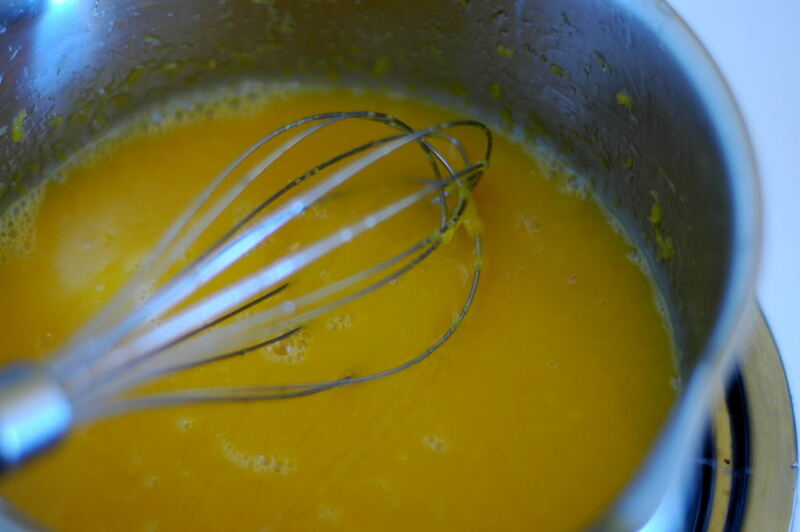 Step One: Combine the egg yolks, lemon rind, honey and lemon zest together in a saucepan. 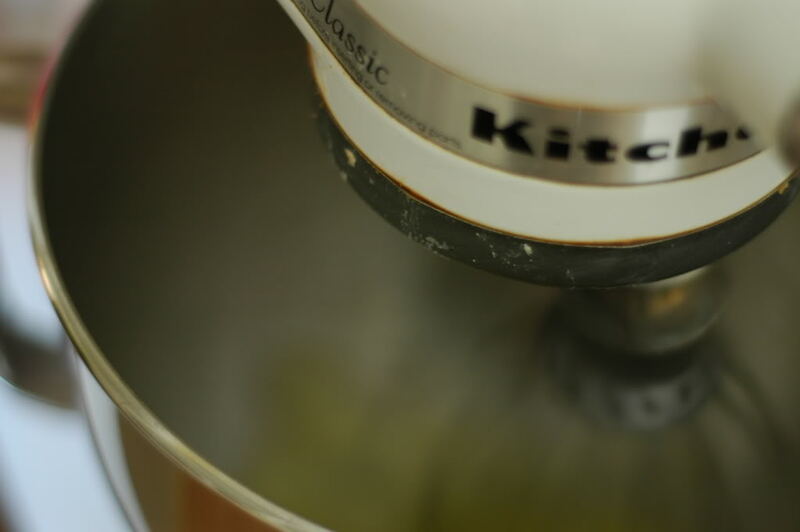 Heat very gently and whisk constantly for about 10 minutes, until the mixture thickens. Remove from heat and chill in the refrigerator for about a half-hour or so. 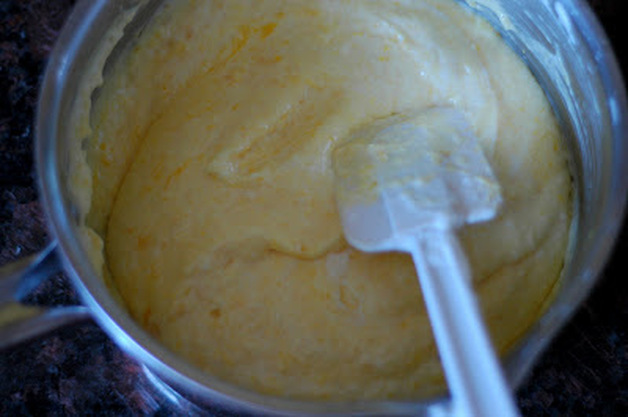 Step Two: While the lemon/yolk mixture is chilling, whip the cream until it’s stiff and forming peaks. 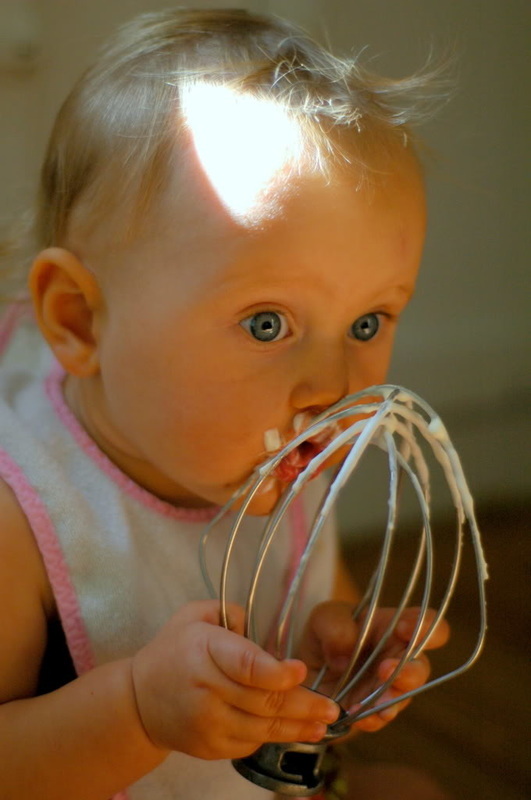 Then, let your baby lick the whisk. She’s only young once, ya know. Step Three: Then, in another bowl, beat the egg whites with a pinch of sea salt until they are stiff and forming peaks. Step Four: Gently fold the chilled lemon mixture in with the whipped cream. Then, gently fold the egg whites in as well. Gently now, people…gently. 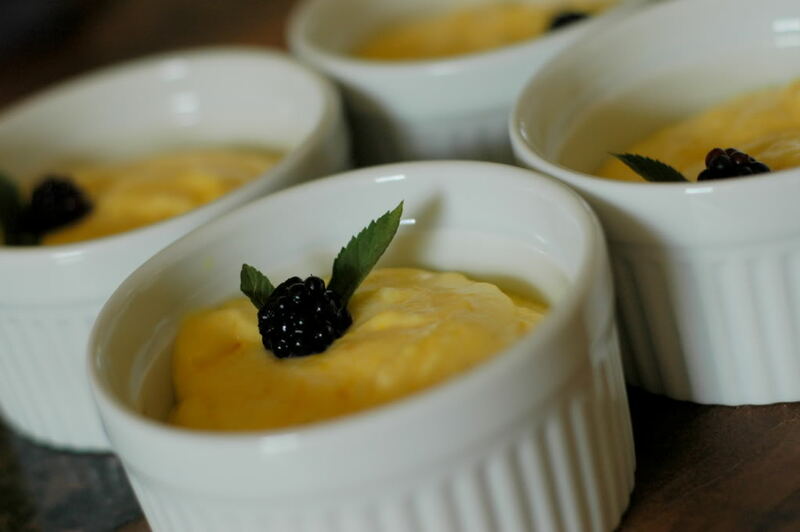 Portion into small ramekins, or dishes of your choice. You can serve this two ways: chilled (from the refrigerator) or frozen (from the freezer). I prefer it frozen, so I just stick the ramekins in the freezer until I’m ready to serve it. Garnish with a few mint leaves. If you’re feeling fancy! Oh la la. This is a super simple dessert that is based on quality, whole ingredients. It’s stripped down to the basics: no artificial lemon flavor, yellow #5, or corn syrup to be found! And that’s the way, uh huh – uh huh, I like it, uh huh – uh huh. Song reference? Anyone get that? Please give this recipe a try and let me know what you think! I love getting to share easy, real recipes with folks just like you. So get to cookin’!